Do I Need Periodontal Therapy in Colorado Springs? Often, when you think about a healthy mouth, a cavity-free smile comes to mind; however, there is another factor that influences it as well—your gums. Among the biggest threat to their health involves a preventable infection known as periodontal disease. Although it can easily be avoided, it is estimated that roughly 50% of adults in America have a form of it. While anyone can develop periodontal disease, there are certain factors that can increase your risk for it. If it occurs, you will need periodontal therapy in Colorado Springs. 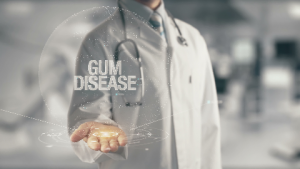 Periodontal disease, more commonly known as gum disease, is an infection that forms in the gum tissue due to bacteria that is found in tartar accumulations. During the early stages, it can easily be treated by changing your oral hygiene habits; however, it often goes untreated. Over time, it can lead to tooth loss while also increasing your risk of several health complications, like heart disease. Often, gum disease is a result of poor oral hygiene habits, like lack of flossing, but there are several other factors that can increase your risk for it. Age: It is estimated that over 70% of adults over the age of 65 have periodontal disease. As you age, your mouth will become drier due to changes in hormones and the use of certain medications. This increases bacteria levels in your mouth, making you more prone to the infection. Genetics: New research suggests that certain genetic markers can increase your risk for the infection. It is estimated that 30% of the population have these markers. Stress-Level: High-stress levels decrease your body’s ability to fight infections by compromising your immune system. As a result, you cannot fight off the bacteria responsible for the infection as easily as those who manage their stress. Medications: Many medications, like those used to control blood pressure, can lead to dry mouth. The decreased saliva production creates the perfect environment for bacteria growth that can lead to the infection. Smoking: Tobacco use in any form significantly increases your risk of gum disease because it lowers your body’s immune system. As a result, you are not only more prone to it, but it will also be more difficult to treat once it develops. You can help to protect the health of your gums by practicing proper oral hygiene habits at home and visiting your dentist regularly for a cleaning and checkup. If you notice the early signs of the infection, like red, swollen, or bleeding gums, schedule an appointment with your periodontist in Colorado Springs right away. With quick intervention, you can stop periodontal disease from spreading. Dr. Karl Lackler not only completed training in general dentistry but furthered his education to focus on periodontics. Due to his advanced qualifications and experience, he is a well-renowned periodontist in the community who promotes optimal oral health. If you have gum disease, he has the solutions you need for a healthy smile. For more information or to schedule an appointment, contact our office today.